I think a coil-bound A5 book full of monsters like this would be cool. Of course, this might be limiting the amount of info you can use to describe a monster a bit too much. I could probably double the space between monsters to allow for more text. It might be useful to have symbols to represent common special attacks like poison. 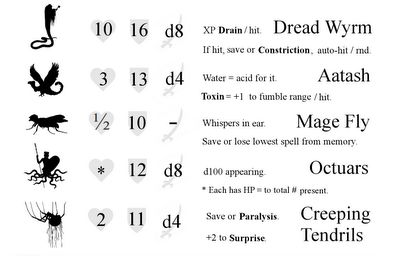 But I'm not sure that Level Drain and Paralysis, for example, are ideas that would have very recognizable as icons. In this draft I just put them as words in bold. Color could be helpful too. I love some of the stuff Roger has done with it. But I've always been thinking about the home DIYer with just a laser printer, like myself. What else would be necessary? Save is tied with HD in my game and would be redundant. Move? Usually not interesting unless it is out of the ordinary and then it could be listed in the text. Ah, morale. I forgot, I was going to use a little flag underlay for that stat. XP and treasure probably too. Roger has size. For my personal use I could just skip most the text and use the extra space for more stats. Imagine a tablet app set up like this where each column could be sorted and tapping on each part of the entry would zoom in for more info. Tapping HD could automatically roll HP. Tapping Dmg could roll the appropriate digital die. The text could blow up into a full ecology if you wanted, maybe with a sample lair. I'd make it so you could sort for monsters with special attacks (give me all the constrictors), type ( let me see the reptiles) or whatever (allow the user to add tags to entries -- maybe Creepy, never used, or OGL). I like the challenge of paper but if digital tools are inevitable it would be cool to have something which uses the spreadsheet's strengths and trys to address its weaknesses. I like it. The perfect visual MM for me would have the monsters' images sized to scale. Sized to scale would be awesome. That'd be a pretty different layout though. Sized to scale and with a number of little calipers equal to size score (1 = human size). I find Move important and non-obvious more times than you'd think. 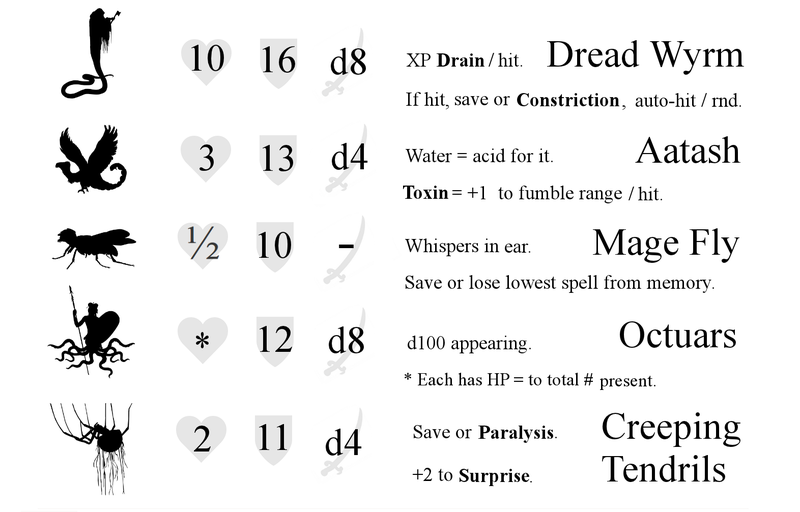 XP can be calculated from hit dice and pips by special abilities but if you're using something more complicated than my 100/HD equivalent then just writing it out is best. Some indication of intelligence and disposition with modifiers for morale and reaction. For my personal use I would put save modifiers but systems vary too much to make this a generally useful thing. Sounds like a very cool idea. And it means more silhouettes! @Theodric/Alec: Yeah, I played around with the size of these a lot. I was going more for easy to identify at a glance and having the sizes out of whack actually was working against that. That mage fly I imagine as being roughly fly-size and the camel head as equivalent to a camel's head size so it gets tricky. I'm still thinking about it though. @Roger: I have an idea for visually showing size that might work. For movement I was mainly thinking that almost everything is 12, 18, 24 or something like that. You might get away with just "Fast" "Very Fast" indicators and leave it blank if it's human normal. I always remember Alexis' monster charts based on Int and think having some simple categories incorporating strategies and disposition like you mention might be cool: "hungry animal" "pixy trixter" "vile torturers" or whatever. @JD: See my next post for Morale. Number Appearing is an oddball to me, doesn't this change based on dungeon level and distance from civilization etc? Maybe an indicator if they tend to go solo, run in pack or herds? No worries. Both can be done. I like the idea of some kind of HTML5 app with tablets and phones in mind. Such a thing wouldn't be terribly hard to cook up. Do it man. Sell it in an app store. :) I was all excited to think of calling it "Monster Digital" but I guess that's been used before. Another great idea! And I agree with Paul, it most definitely need to be in a digital form as well, randomized and all. Visual MM II + Fonts!